Chestnuts are a popular and traditional Christmas food item. They are traditionally cooked by roasting, and served warm. Most people are particularly reminded of them by the lyrics of the classic song, "The Christmas Song", which refers to roasting them in the very first line of the song. This song was originally written by Mel Tormé and Bob Wells in 1944, and first recorded by The Nat King Cole Trio in 1946 (there have of course been many subsequent recordings, by numerous other artists, since then). Chestnuts are usually available from many supermarkets and other stores, and since they are so easy to cook, and tasty, we would recommend that you give them a try. It is hard to describe exactly what roast chestnuts taste like (that is why you should try them), but they have a sweet nutty flavor, and a texture similar to that of a baked potato. Split the skins of the chestnuts. This is to prevent them bursting when they are being cooked. Preheat the oven to 390°F (200°C; Gas Mark 6). Place the chestnuts on a baking sheet, and cook them for about 10 minutes. 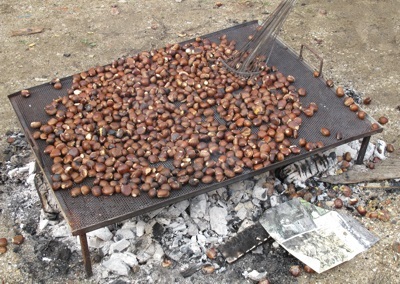 When the chestnuts are cooked, remove them from the oven. Serve while still warm. As well as roasting chestnuts, there are of course other ways to cook chestnuts too. These include frying, boiling, steaming, grilling, and even candying. If you've never tried them, we recommend that you try eating candied chestnuts at least once! Candied chestnuts are prepared from whole chestnuts which are coated with sugar syrup and then iced. You can find them in shops sold under the name of "marrons glacés" - the French name reflects the fact they were invented in 16th Century France, and since the 19th Century have been produced on an industrial scale in the French city of Lyon.